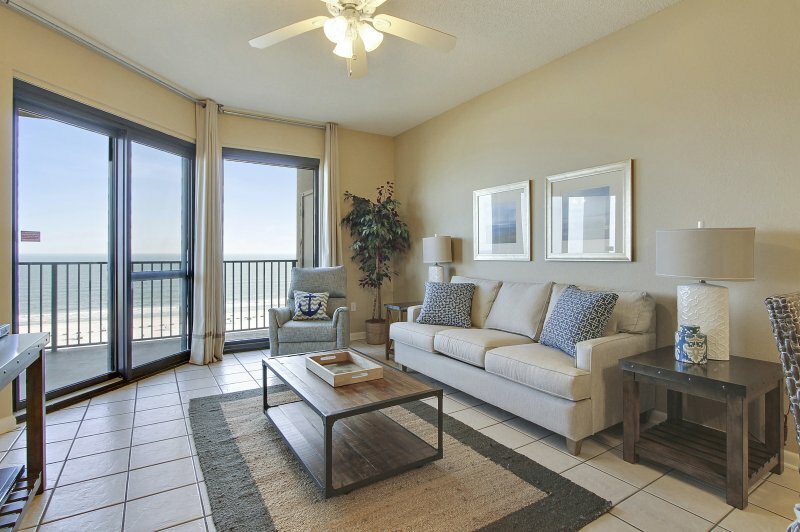 Come stay in our 2 Bedroom | 2 Bath beach front condo that has all you need for your Beach Getaway. The Living area has a queen sleeper sofa, and Flat Screen TV so you can watch all your favorite shows and games. We also have free WiFi connection in the condo.. Clean, blue waters and white sand as far as you can see! 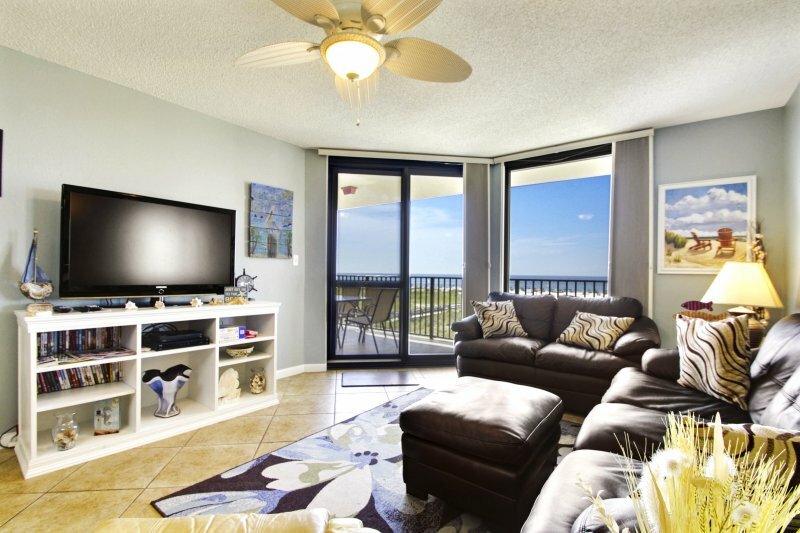 This condo is on the 2nd floor and features a Private Balcony overlooking the Gulf of Mexico offering a beautiful view of the beach. Watch the dolphins make their daily rounds. You will not be disappointed nor will you find this level of luxury anywhere for this price! This kitchen has stove, microwave oven, and small appliances. and offers you all the luxury you only dreamed of. The unit sleeps 8 and is the perfect getaway for you and your family. No Check In procedure to deal with or Standing in lines. When you arrive go straight to your condo and get your swimsuit on - then Hit the Beach ! This is your ideal vacation getaway. 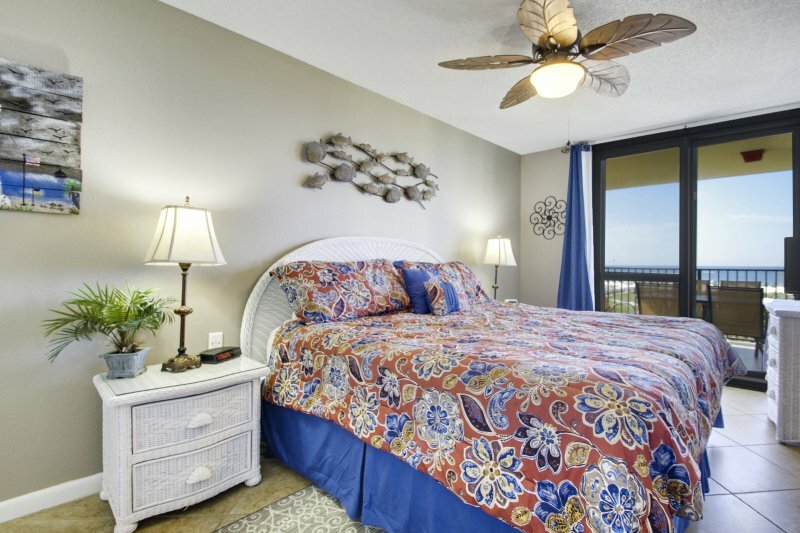 Master Bedroom has a King Size bed, Flat Screen TV, ceiling fan, reading lamps and a private entrance to the balcony. 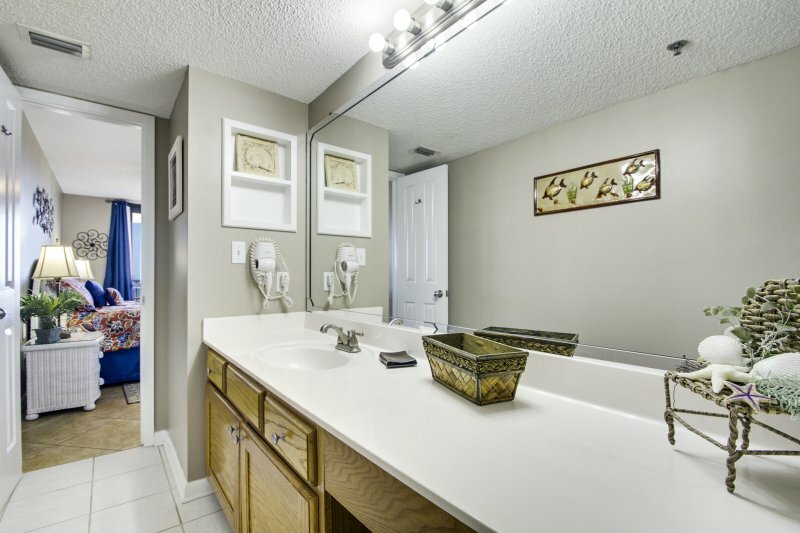 The private Master Bathroom is equipped with an extra large vanity area with hair dryers and portable make up mirror. This bathroom has private tub and shower combination. 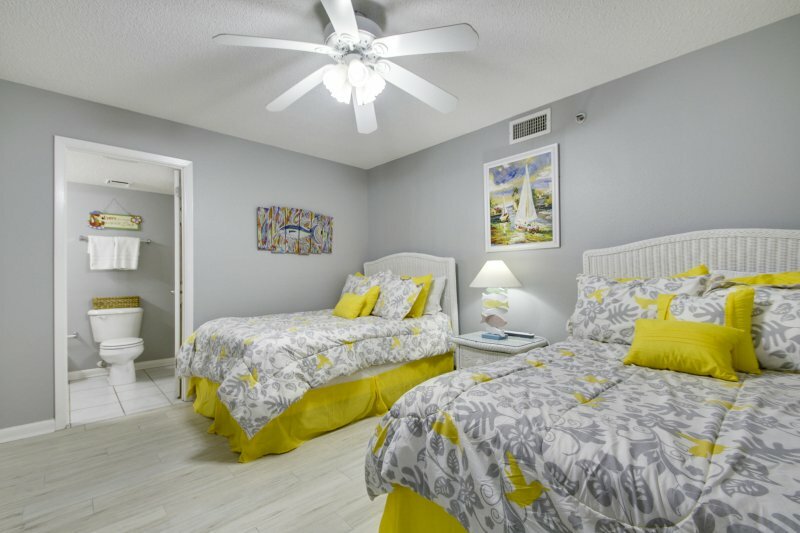 This bedroom features 2 Full Size beds with Flat Screen TV & DVD player, ceiling fan, reading lamp, and a closet. Private Guest bathroom features a tub and shower combination with hair dryer. We, of course,have a fully equipped Kitchen with all major appliances with upgraded cabinets and granite countertop. Make your morning coffee with our Keurig or regualr coffee maker. Also, if you prefer you can go downstairs to the lobby to get your coffee already made for you each morning. And yes we have a Washer and Dryer in our condo so you don’t have to bring your full wardrobe. Our building has a beautiful beach-facing pool with waterfalls, an indoor pool and several hot tubs. And yes there is a Kiddie pool that is fenced in for your children’s safety. This luxury facility boasts an indoor racquetball court, state of the art fitness center and a sauna. You will not be disappointed nor will you be able to find this level of luxury and convenience anywhere for this price! 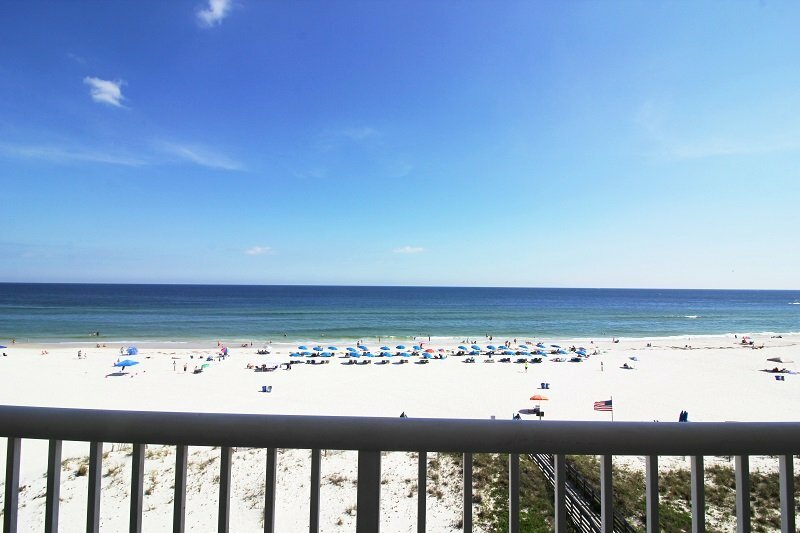 Description Come stay in our 2 Bedroom | 2 Bath beach front condo that has all you need for your Beach Getaway. The Living area has a queen sleeper sofa, and Flat Screen TV so you can watch all your favorite shows and games. We also have free WiFi connection in the condo.. Clean, blue waters and white sand as far as you can see! 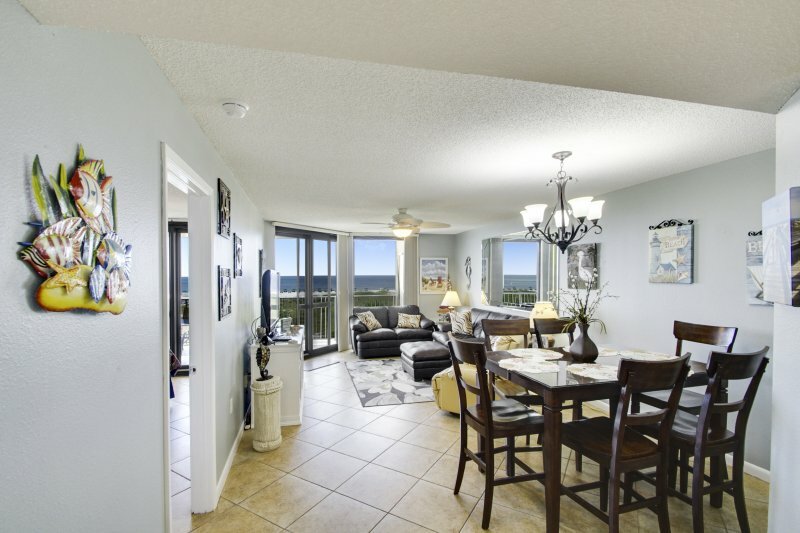 This condo is on the 2nd floor and features a Private Balcony overlooking the Gulf of Mexico offering a beautiful view of the beach. Watch the dolphins make their daily rounds. You will not be disappointed nor will you find this level of luxury anywhere for this price! This kitchen has stove, microwave oven, and small appliances. and offers you all the luxury you only dreamed of. The unit sleeps 8 and is the perfect getaway for you and your family. No Check In procedure to deal with or Standing in lines. 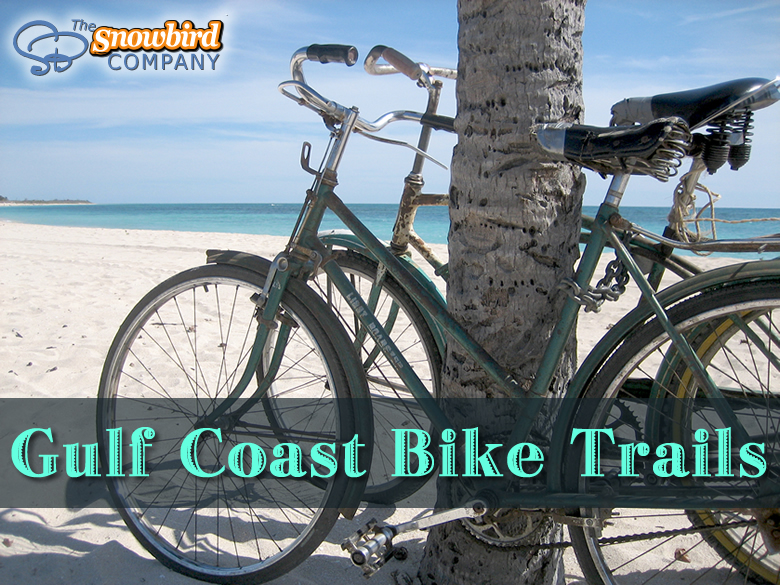 When you arrive go straight to your condo and get your swimsuit on - then Hit the Beach ! This is your ideal vacation getaway. The Master Bedroom: Master Bedroom has a King Size bed, Flat Screen TV, ceiling fan, reading lamps and a private entrance to the balcony. 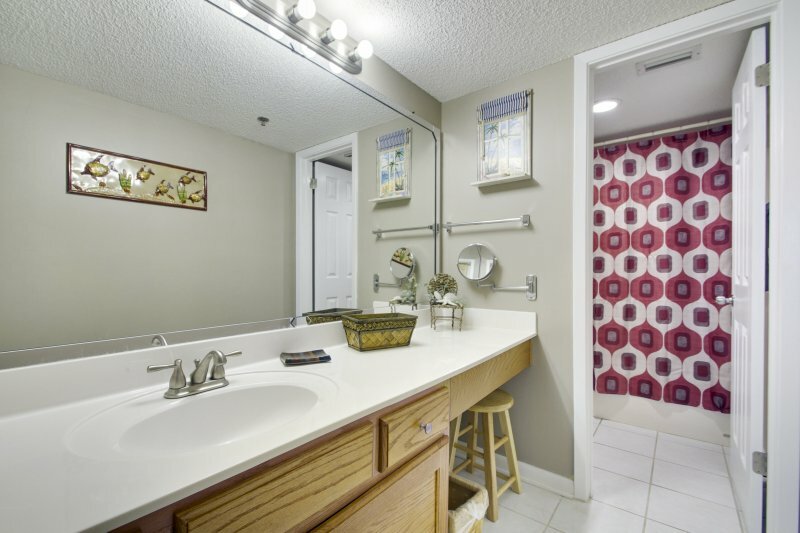 The private Master Bathroom is equipped with an extra large vanity area with hair dryers and portable make up mirror. This bathroom has private tub and shower combination. Guest Bedroom This bedroom features 2 Full Size beds with Flat Screen TV & DVD player, ceiling fan, reading lamp, and a closet. Private Guest bathroom features a tub and shower combination with hair dryer. 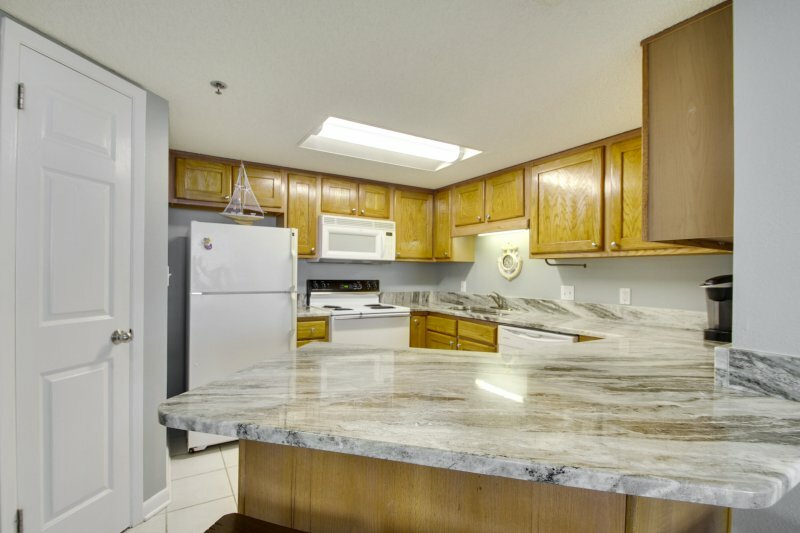 We, of course,have a fully equipped Kitchen with all major appliances with upgraded cabinets and granite countertop. Make your morning coffee with our Keurig or regualr coffee maker. Also, if you prefer you can go downstairs to the lobby to get your coffee already made for you each morning. And yes we have a Washer and Dryer in our condo so you don’t have to bring your full wardrobe. Our building has a beautiful beach-facing pool with waterfalls, an indoor pool and several hot tubs. And yes there is a Kiddie pool that is fenced in for your children’s safety. This luxury facility boasts an indoor racquetball court, state of the art fitness center and a sauna. You will not be disappointed nor will you be able to find this level of luxury and convenience anywhere for this price! 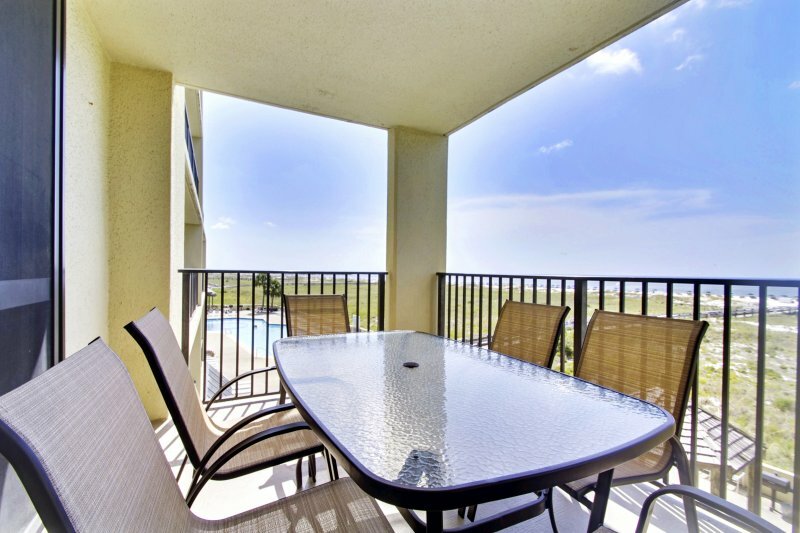 Parking: There is a spot designated for this condo in a covered garage with easy access to the elevators. You are only permitted 2 vehicles at the building. You will still be required to get a parking pass at the front desk. Parking passes are about $36 after tax. 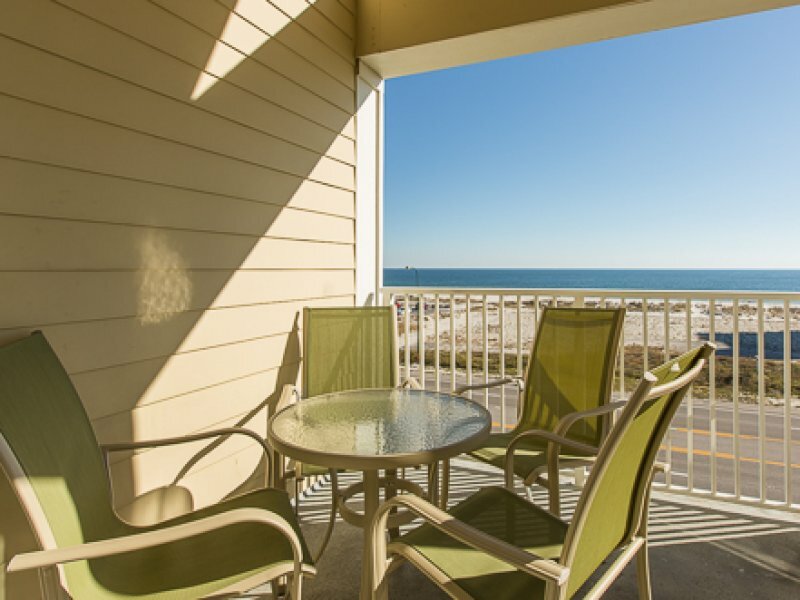 This condo is on the 2nd floor and features a Private Balcony overlooking the Gulf of Mexico offering a beautiful view of the clean, blue waters and sugary sand beach as far as you can see!